Its Friday! Which means it’s time once again for the weekly video round-up of my favorite pop culture atrocities, misfires and entertaining trainwrecks. This week’s theme: Quentin Tarantino. You know, in this business right now, there are a whole lot of people making movies to pay for their incredibly extravagant lifestyle. I never want to have to do that, and I don’t have to do that. guys-on-a-mission movie, that is a little bit Where Eagles Dare and The Dirty Dozen, where they’re fighting Nazis. When it premiered at the Cannes International Film Festival in May, the response was decidedly lukewarm, prompting last minute edits to reduce its running time. Next week Tarantino will be here in Chicago to accept a Career Achievement Award from the Chicago International Film Festival. He’ll also be presenting a sneak preview of Basterds before it opens. In honor of his latest achievement, let’s put the spotlight on some of his notorious and reckless career mistakes. 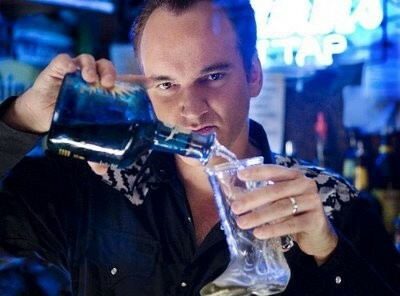 It’s been fourteen years since Quentin-mania burst onto the Hollywood scene after the release of Pulp Fiction. Few filmmakers reach that level of fame and success at such a young age. In those early halcyon days of 1994-95, Tarantino seemed like a kid in a candy store. He showed up as an actor in movies like Destiny Turns On The Radio, Sleep With Me (where he made a splash playing a party guest who lectures everyone about the homosexual subtext of the movie Top Gun) and Desperado. He also appeared on comedian Margaret Cho‘s sitcom, All American Girl, and worked as a script doctor, doing uncredited re-writes for It’s Pat and Crimson Tide. Then there was Four Rooms. He and producer Lawrence Bender came up with the idea to make an anthology film and enlisted fellow hip, young director friends, Alexandre Rockwell, Allison Anders and Robert Rodriguez, who had each recently scored with indie films of their own. The four of them also shared something special in common: they had all been the darlings of the 1992 Sundance Film Festival. It’s exciting when you’re just starting to make films, and you first learn about the French New Wave or New German Cinema. Those guys all hung out together and they made films together and they were all part of a time. Filmmakers, especially young filmmakers, want to belong to something. We were all sort of the Sundance class of ’92 or ’93. It’s no surprise that the finished product turned out uneven and aimless. 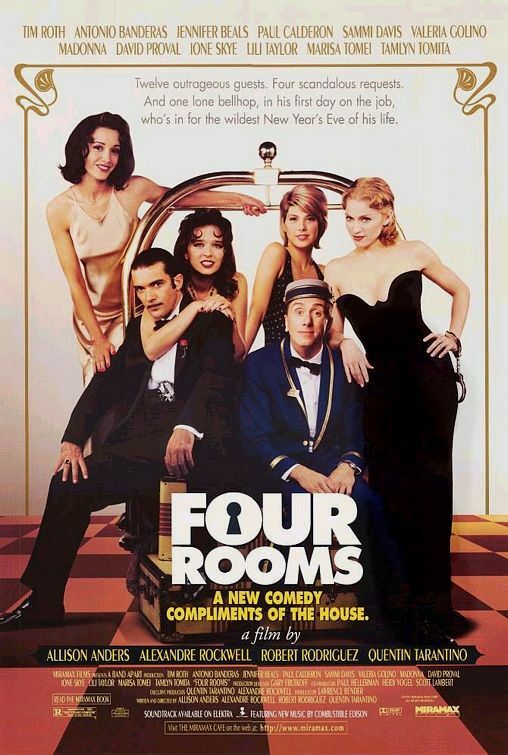 The plot centers on a bellboy at a Los Angeles hotel on New Year’s Eve as he encounters “four rooms” worth of deranged guests. 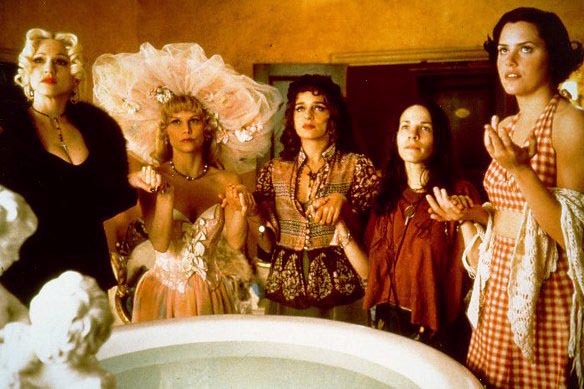 The first two segments, by Anders and Rockwell respectively, make little to no sense, despite a strong cast (Ione Skye, Valeria Golino, Jennifer Beals, Lili Taylor, Madonna) and good cinematography. Rodriguez’s story, which inspired his hit franchise Spy Kids, turned out to be the sole segment that received unanimous praise. By the time Four Rooms gets around to Tarantino’s 45-minute take on Roald Dahl‘s “The Man from the South”, where he plays a Hollywood director (ho ho) hot off a box office hit, the movie loses its steam. It really isn’t that bad on its own, as the camerawork and dialogue is actually a lot of fun, but it doesn’t fit quite right in Four Rooms. Nothing does. It’s like the Weinsteins threw a good idea in a bag and beat it with a baseball bat. And poor Tim Roth. In a brilliant, manic, cartoon-like performance, he’s the glue that barely holds the segments together. This film is only useful as a case study of what happens when indie filmmakers believe their own hype. The production’s sheen conflicts awkwardly with the thin material, making the movie’s lack of real wit and quirky playfulness all the more noticeable. Helmers should move into their next projects to put this embarrassment behind them as quickly as possible. “I feel bad about Paula leaving. I really liked her on the show. I figured at some point, one of the three would break off. But you know, it’s sad. It’s disappointing. I will miss her next year for sure. 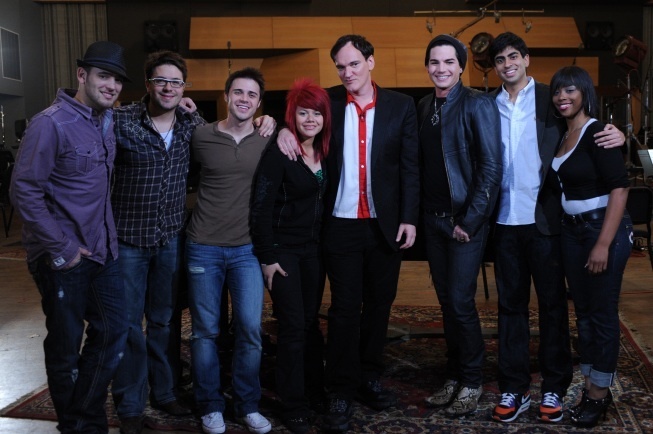 Tarantino has appeared on the show twice as a guest judge, once in the third season (where he famously critiqued Jennifer Hudson by saying, “Hudson takes on Houston and wins!”), and in the most recent season as a celebrity mentor. His persona has always been that of a cool dork, but, as the years go by, it’s seems as if the “cool” part of that equation is rapidly fading away. In the clips below, you’ll see him geek it up during one of his Idol stints, and you’ll see him geek it up even more during a talk show appearance a couple of years later. The strangest moment comes when he does an embarrassing imitation of one of his “black chick” friends watching Idol (“Simon’s alwayyys rigghhht”). That is the moment when his last remaining credibility of being cool goes out the window. It’s the most adventurous thing Bob (Weinstein) and I have done since the early days of our company. It’s a huge risk. I love the danger of it. I love these guys for pushing us. While the original idea was for each segment to last 60 min, both filmmakers ended up shooting full length features. 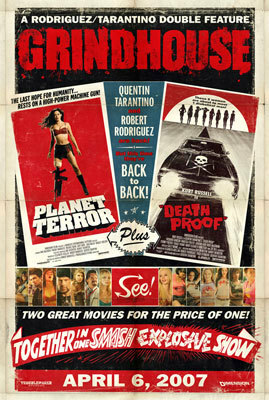 Rodriguez shot Planet Terror and Tarantino shot Death Proof. First of all, I’m incredibly disappointed. We tried to do something new and obviously we didn’t do it that well. It’s just a question of how is it going to hang in there. But we could split the movies in a couple of weeks. Make Tarantino’s a full-length film, and Rodriguez’s too. The Weinstein Company scrambled to recover from the high-profile loss and an extended version of Death Proof was entered into the Cannes Film Festival. While receiving some accolades from the French, the film failed to make a mark even close to the one his previous features made. The result is a “horror” flick with lots of tough women who talk and talk and talk. We meet one group and they carry the first half of the movie. Then we meet a whole other group and they, essentially, do the same things that the first group does. It’s like seeing watching the same episode twice. There are endless dialogue sequences where they discuss pop songs, sexual exploits, mix tapes, European fashion magazines and exploitations movies like Vanishing Point. After awhile, I lost sight of the fact that these were supposed to be living, breathing characters. To me, it just seemed like Tarantino talking. I had thought this about Death Proof when I had first seen it as one half of Grindhouse as well. Don’t get me wrong, I still think that Grindhouse is amazing as a whole. The fake trailers, the scratches, the double feature– it’s all great. 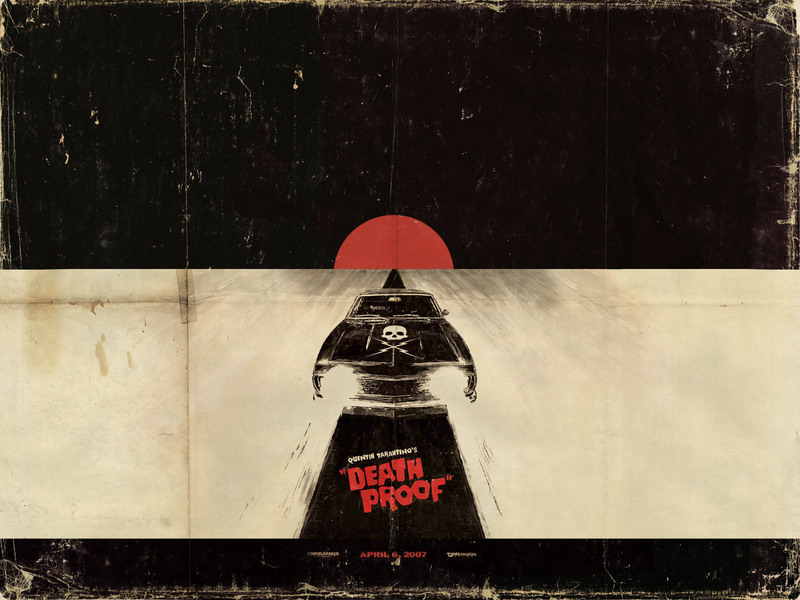 But, the truth is, Death Proof, by itself, is not very thrilling. It has some terrific moments, such as the opening title sequence and the big car chase finale, but it doesn’t hold up as a major feature. That’s why the extended version that went to Cannes is so appallingly bad. The first one had already been too long. Why would anyone want to see the dialogue sequences drag on even further? Just because you make a film longer, doesn’t mean it will be any more of a film (as evidenced by the laughably slim, post-Grindhouse trailer below). Death Proof is masturbatory filmmaking to the highest degree.